Trump’s shameful and out of context attacks on Sadiq Khan, the popular mayor of London, have only reminded us of what a boor Trump is. 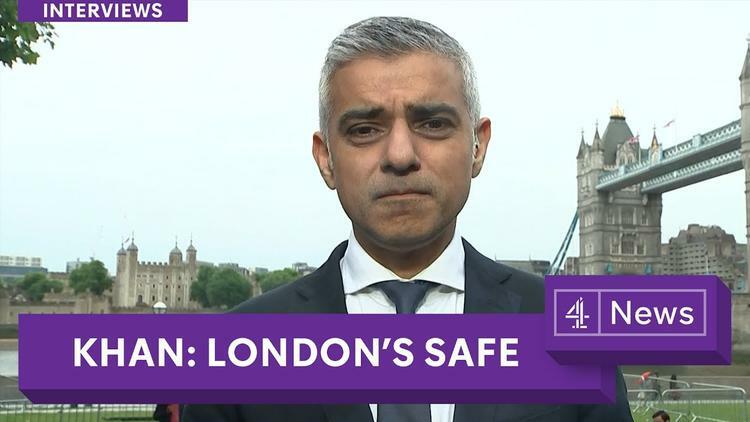 Sadiq Khan did a video announcement to Londoners after the vicious attack on Saturday night by members of the radical Al Muhajiroun extremist organization. In it, he noted that he was putting extra police on the streets of the UK capital, but that the public should not be alarmed by this step. He wanted them to interpret it as added security, not a sign of extra risk. Trump went off on Khan on Twitter, trying to make it seem as though the mayor had been playing down the seriousness of the attack. He was not. “London stands in defiance against this cowardly attack on our city, our people, our values and our way of life. I want to send a clear message to the sick and evil extremists who committed these hideous crimes. We will defeat you. You will not win,” he said, flanked by politicians from across party divides, police officers and leaders from different faiths. I don’t think it can be sufficiently underlined how important it is for the UK’s Muslim community of some 3 million persons (out of 65 million) to hear a respected public figure such as Khan speaking this way. British Prime Minister Theresa May, who is in the midst of a hard-fought election to be determined later this week, has been put in a difficult position by Trump’s cold-blooded rudeness and attempt to grandstand on the bodies of Saturday’s victims. “I think Sadiq is doing an excellent job. “We’re working with the Mayor of London and City Hall to ensure, for example, that the transport network is able to get back up and running so that people can go about their business. “I’ve been very clear, I’ve been very happy to say when I think President Trump is wrong – to have taken America out of the climate change agreement, the Paris agreement. Theresa May’s comments seem to me the biggest indictment possible of Trump as a politician. As the leader of Britain’s Conservative Party, she ought to be able to express warm support for a Republican president. That she feels she has to slam this one has everything to do with (odious) personality and little to do with policy. That as a Tory she feels she has to support a Labor mayor of Muslim heritage is breathtaking. In turn, it is hard to see how Trump’s drunk uncle night time Twitter rants are not hurting the United States and its soft power in diplomacy.